In response to my glowing, 4-apple review of Ippudo, a reader suggested Hide-Chan in midtown as a worthy contender. Combine this endorsement with a mention of Hide-Chan’s black garlic ramen from another buddy, and I was intrigued. I do love my carbs, yes. But a ramen joint worthy of Ippudo’s ranks? Did such a place really exist? I was determined to find out. Upon arrival, my eating buddy and I were seated within 5 minutes – a feat absolutely unheard of at Ippudo (especially on Friday night at 8pm). Ok, not bad, not bad. I also noticed the ratio of Japanese-speaking patrons was quite high – I know that doesn’t necessarily mean the food is good, but it’s something I keep an ear out for when dining at any ethnic restaurant. 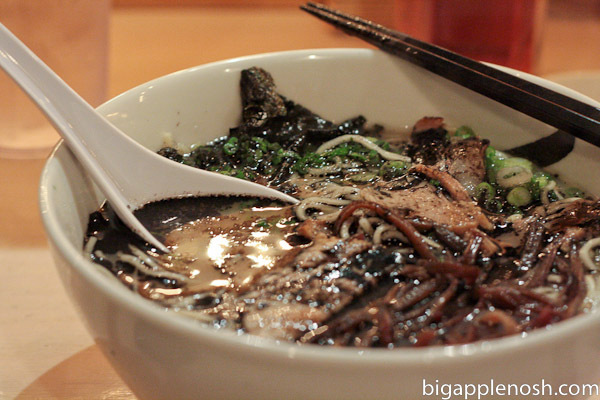 Thirdly, the ramen prices were quite affordable – ranging from $9.50-$11 (compared to Ippudo’s $13-$14). Alright, we’ve got no wait, Japanese people, and cheap(er) ramen. But was that enough?? We started our meal with some gyoza, recommended to us by the waiter. 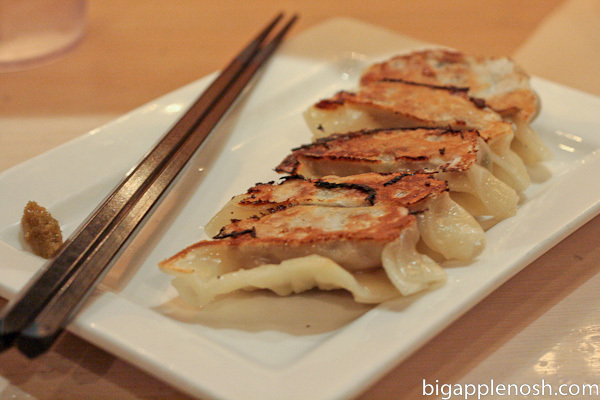 While tasty enough, the gyoza were tiny and the 5-for-$5 price didn’t cut it for me. I mean, I’m used to my 5-for-$1 dumpling joints in Chinatown. These were good, but I’d try something else next time. Now came the moment of truth. I ordered the “black ramen,” officially know as Hakata Kuro Ramen, with roasted garlic oil, as well as the traditional pork, seaweed and scallions. When my big bowl of slurpy noodle goodness was placed in front of me, the slick oil adorned the slab of fat pork like a viscous mess. Make that a viscous, mouthwatering, mess. Excuse me while I wipe the drool off my laptop. 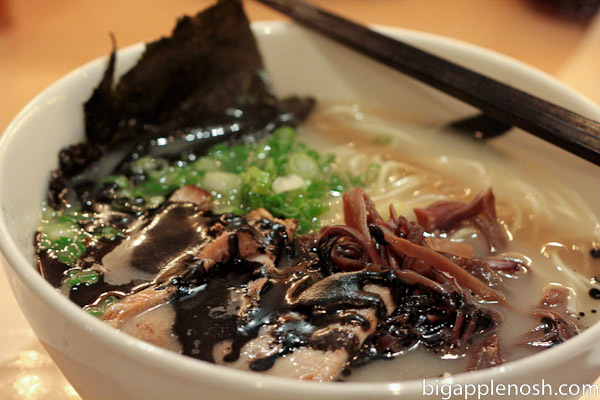 The garlic oil is potent but not overwhelming, and the roasted aroma brought warmth to the salty, pork-flavored broth. The noodles were cooked perfectly, al dente and with the chewiness that is sloppily done in sub-par ramen joints. I delicately wolfed down this umami-laden bowl of joy. Does Hide-Chan provide a good replacement for Ippudo? The jury’s still out on this one. I would have to say no – there is something so addictive about Ippudo’s Akamaru Modern that is irreplaceable to me. However, my eating buddy preferred Hide-Chan’s black garlic oil – and I must admit, for the price and the lack of wait-time, it does present an attractive package. I’ll be returning to both shortly to re-sample the Modern and the Kuro – purely in the name of research, of course. That’s justifiable eating, isn’t it? Ippudo still reigns supreme, but at 2/3rd the price and no wait, Hide-Chan is a contender. Garlic fan? Yay or Nay? Looks delicious – and the garlic oil sounds so yummy! Intriguing and I so want to try it now! I had ramen this weekend and vow to find more places here as well. Gyoza btw is the biggest rip off but I'm addicted so still order them every time! oh hell yum. may have to go there if going to ippudo feels too far. Noodles, pork, garlic? I'm in.